The micronization technology has been used in many industries since the 1970’s and has been further developed to suit the agricultural input industry. The specific micronization/particle to particle collision technology allows the mineral particles to collide at a very high rate, three collisions per millisecond at speeds as high as Mach 2. This technology enables the production of sub micronmineral particles involving a dynamic development of friction and high speed collision. The surface of the particles is then said to be activated with a particle size averaging around 8μ(micron), with no metal residue present inside, and without the contribution of electrochemical techniques, which would otherwise spoil the natural composition of the mineral. Once the Herbagreen powder is mixed with water and sprayed on a leaf surface, Herbagreen starts working directly through penetrating the leaf pores (stomas leaf organs which control the gas exchange in the plant) by traveling through to the plants interior. This is possible due to the granulometry of Herbagreen (average 8μm) which is a much smaller size than the leafs pore opening (ostiole). 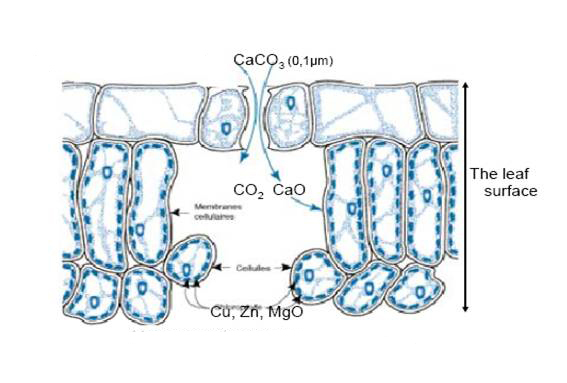 Due to the increased bioactivity in the leaf, the calcium and magnesium carbonates gradually disintegrate into oxides (CaO and MgO) and carbon dioxide (CO₂). The carbon dioxide creates a leaf microclimate suitable for photosynthesis, it is used to create carbohydrates, and decreases the plant’s need for water. Calcium, magnesium and iron increase the plant’s resistance to disease (chlorosis, necrosis) and pests (downy mildew, gray mould, oidium), and promote chlorophyll creation. 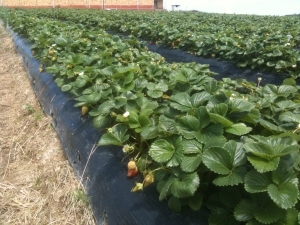 The silicon increases the plant’s energy status, improves its growth and significantly shortens the vegetation time. Common outcomes are less water consumption, vibrant colours, more fruit production, and stronger resistance to diseases and pests. Shortens time to ripening (with up to 30%). Increases the content of dry matter, resulting in a better crop quality. Improves the resistance to diseases and pests. Revitalizes the soil, because less soil fertilizers are necessary. Increases plant growth and crop yield (up to 30%). Reduces the need for watering (up to 50%). *Picture to the bottom right. Strawberry trial with Herbagreen and VitaFlora.